The village is located at the confluence of the Dourdou and Ouche rivers. 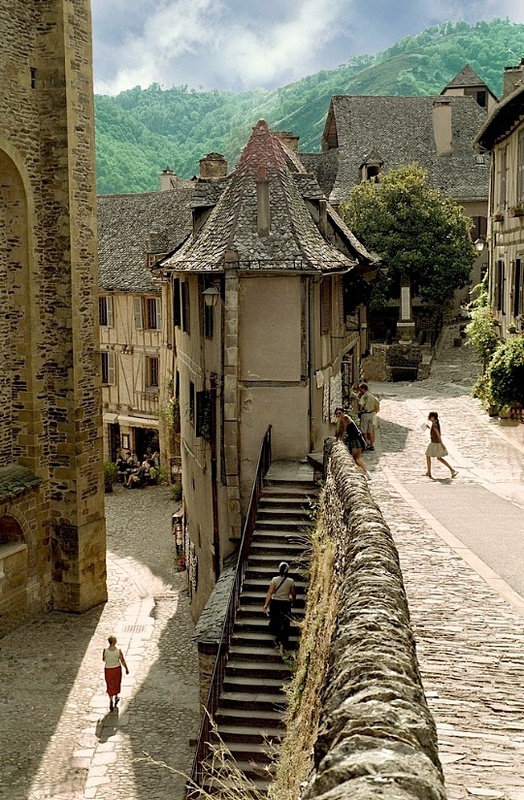 It is built on a hillside and has classic narrow Medieval streets. As a result, large vehicles (such as buses) cannot enter the historic town centre but must park outside. Consequently, most day visitors enter on foot and, as at least one overnight visitor has observed, the majority of the tourists depart in the late afternoon, leaving the town much less crowded. The town was largely passed by in the nineteenth century, and was saved from oblivion by the efforts of a small number of dedicated people. As a result, the historic core of the town has very little construction dating from between 1800 and 1950, leaving the medieval structures remarkably intact. The roads have been paved, and modern-day utility lines are buried.